Such a handy little pouch! We are always digging around in our backpack or gym bag for our bits and bobs like phone, id, change, lip balm, and jewelry. 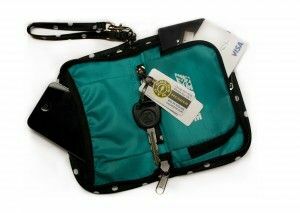 Active Accessories’ On-The-Go Accessory Pouch easily solves that problem. Made out of water resistant, durable fabric, there are 2 pockets and a handy snap button holder for keys, rings and hoop earrings inside a zippered case about the size of your phone. We found the short handle with clip closure super convenient to attach the pouch to a larger bag or even gym equipment while working out. Comes in 4 colors. Also check out Active Accessories’ hair band bracelets that are soft but strong elastic ribbons in lots of fun colors and prints. Great, functional TrailblazerGirl finds!